The occupants of the building had cleaned out their offices. Carts of boxes with books, papers and years of mementos made their way down the hallway. Riding on some of the carts assorted plants were going to their new homes. Soon the building was silent. But in the corner of one office, on a windowsill, sat a tall plant unwanted by its previous owner. The plant enjoyed the sunny window even if no one was watering it. The plant could go without water for long periods of time. No problem! The days turned into weeks. No Problem! The weeks dragged on, the sound of buildings coming apart could be heard in the distance. No Problem! Somewhere the building was opened to the winter elements. The cold chased the warmth from the deserted building. No Problem! Walking through the hallways for the last time I spotted the plant on the windowsill. Standing there defiantly, with hundreds of sharp thorns, waiting for someone to touch it much less move it. No wonder its previous owner left it there. 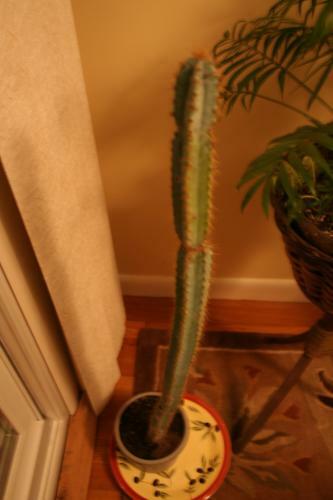 But this would not be the first tall pincushion of a plant I owned. I took the plant with me, stopping by a conference room to collect another plant. The tall plant would ultimately go with me when I retired. I think we could learn something from this plant.